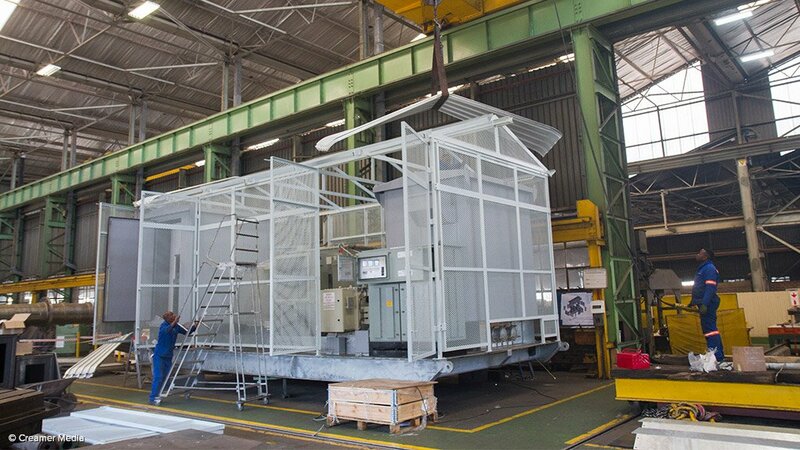 Medium to heavy engineering company Parnis Manufacturing has secured a contract to fabricate modular electrical houses (E-Houses) for a mine in Africa, which it attributes to its established record for high-quality manufacture. The continued trend to make use of E-Houses has seen a marked increase in the demand for a company that can manufacture these structures to the necessary quality standards, says Parnis Manufacturing GM Gary Colegate. E-Houses are mobile or modular houses that are fully equipped electrical substations, which are manufactured using insulated steel panels designed to provide customised solutions. Parnis Manufacturing’s turnkey service includes design, fabrication, assembly, electrical and fire installations, testing certifications and site installations. Colegate states that the E-Houses being sent to the mine in Africa are intended to serve not only as an electrical control room, but also include office space and a toilet. He adds, when compared with traditional brick and mortar substations, an E-House is more cost effective as it does not require civil infrastructure to be built and, therefore, also saves time. Most E-Houses comprise a base frame on which insulated panels are installed to form the basis of the wall and roof structure. The interior is populated with the required electrical equipment and auxiliary systems, which include heating, ventilation, and air conditioning; fire detection and suppression; furniture and fixtures; gas systems and all cabling reticulation. Contracts for E-Houses are secured by either engineering, procurement and construction management contractors or electrical original-equipment manufacturers, and most have neither the facilities nor the capability to undertake such large fabrication work. Colegate says the latest unit was shipped to the customer at the beginning of the third quarter of this year. Parnis operates a manufacturing plant south of Johannesburg and has the ability to handle a range of medium and heavy engineering projects. In July, Parnis explained that difficult market conditions were forcing companies in many sectors to relook at cost structures and that high-quality refurbishment is becoming more important as a strategy to contain costs. Colegate says such strategies demand that the company’s customers find experienced partners with both the technical capacity and responsiveness required for demanding projects, whether these are for exist- ing or greenfield projects. “The economic situation looks unlikely to change in the near future, having been further aggravated by the announcements regarding the Mining Charter and its requirements,” states Colegate. 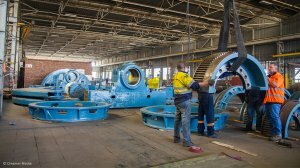 He points out that the company has been engaged for decades in the mining sector and has experience in manufacturing equipment, such as mine winders and their components, boiler components, fans and fan casings, mill heads and sheave wheels. 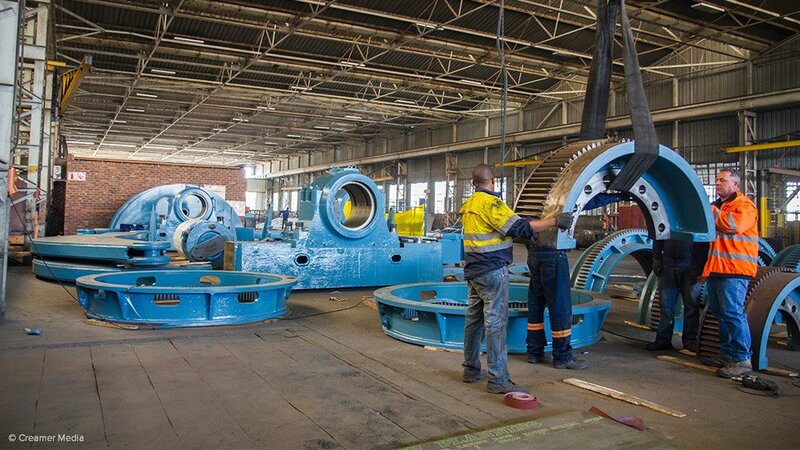 Colegate highlights that vertical boring capacity at Parnis Manufacturing extends to a table size of 4.5 m, a turning diameter of 5.3 m and a turning height of 3.2 m, with a maximum load of up to 50 t. Other equipment includes horizontal borers able to accommodate 5.5 m longitudinal travel and a height of 2.5 m, milling machines with 4.5 m longitudinal travel and a height of 1.8 m, as well as an overhead crane lifting capacity of 50 t (tandem). “Earlier in the year, we delivered a completely refurbished mine winder to a privately owned gold mine in Zimbabwe. “The equipment – which dates back to the early 1950s – was used for decades on a South African gold mining operation. It was bought for use in Zimbabwe and needed to be returned to a high operational standard,” Colegate noted in July. Established in 1975 by CEO Mario Guerini, Parnis Manufacturing is focused on the fabrication and machining of medium to heavy engineering components for various local industries. It also undertakes container conversions. In addition to its baseload work for the mining sector, Parnis Manufacturing has made great strides in servicing the energy sector. “We have diversified into a number of fields, thanks to the entrepreneurial approach of Guerini. An important area of expansion has been into the design, fabrication and assembly of mobile, modular E-Houses – fully equipped electrical substations,” he concludes.